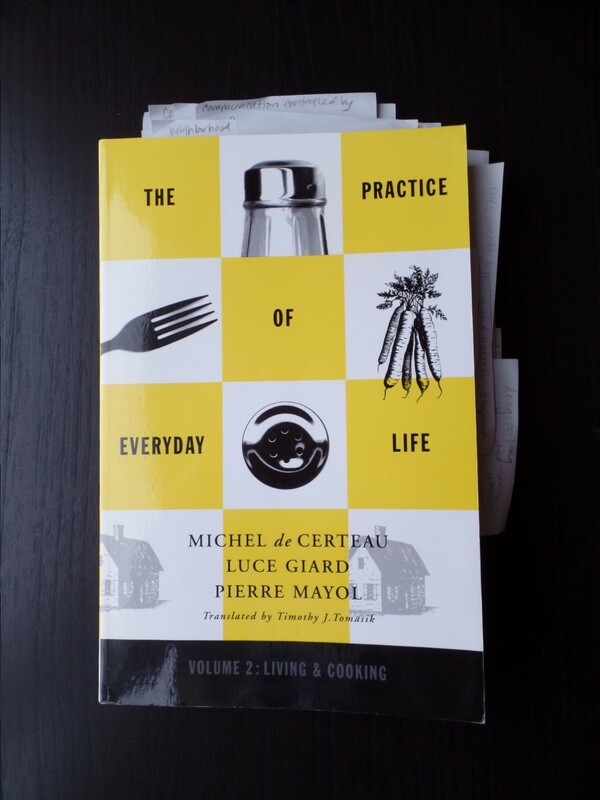 The Practice of Everyday Life: Living and Cooking – The Bookshelf of Emily J.
I ordered The Practice of Everyday Life: Volume 2: Living and Cooking (1998) by Michel de Certeau, Luce Giard, and Pierre Mayol as a companion to de Certeau’s The Practice of Everyday Life. This second volume seemed to be more aligned with my research interests and topic, as I read both of these books for my upcoming Ph. D. comprehensive exams. I enjoyed reading the final section of this book, written by Giard, which focused on cooking. There I found the most interest for me as a scholar. Giard researched the kitchen in a French village. She conducted interviews with women there and used de Certeau’s ideas about everyday practices to ground her research. She found that cooking is a complicated activity, one that requires skill and attention and “doing.” Many theorists talk about learning by doing and attempt to vindicate the everyday, mundane, and ordinary by defending its complexities. (See authors like Mike Rose, Etienne Wenger, and Richard Johnson.) She wrote, “I discovered bit by bit not the pleasure of eating good meals . . . but that of manipulating raw materials, of organizing, combining, modifying, and inventing. . . . I had been invested with the secret, tenacious pleasure of doing-cooking” (p. 152). She goes on to explore how women are engaged in this and what skill it takes to do so. She wants to “retain a living a true memory” of “women educated at the time of my grandmother’s generation” (p. 153). In talking with the women, she discovered, “They are voices that talk simply about ordinary practices with everyday words, women’s voices that talk about the life of people and things” (p. 161). These voices are important, and give insight not only into women’s experiences, but into how we accomplish everyday life in the most ordinary of tasks, and in turn, we learn that these tasks might just be extraordinary. She argues, “feminine activities are a place of silence or disinterest that [other scholars’] analysis does not trouble itself to take into account” (p. 183). She attempts to rectify this with her own research, as many feminist scholars do by simply listening to women’s voices and giving their experiences presence. However, Giard doesn’t necessarily consider the kitchen to be feminine. She wrote, “the everyday work of doing-cooking stems from a social and cultural condition and from the history of mentalities; I do not see the manifestation of a feminine essence here” (p. 151). The example of this that pops into my head is that some cultures expect men to cook and clean. Women are not always associated with domestic work. Giard learns that food is connected to the past, and that childhood is where we form memories about food that continue into the future. “Eating, in fact, serves not only to maintain the biological machinery of the body, but to make concrete one of the specific modes of relation between a person and the world, thus forming one of the fundamental landmarks in space-time” (p. 183). Food grounds and connects us. It “becomes a veritable discourse of the past and a nostalgic narrative about the country, the region, the city, or the village where one was born” (p. 184). We all have what we call “comfort” foods, and memories about those foods. For me, it’s beef stroganoff, the only meal I truly loved in my childhood home. For my husband, it is the simple comfort of meat and potatoes. I enjoy exotic foods, but those plain, heavy meals from childhood stand out. Much of what Giard studied is placed against the backdrops of technology and power. She argues that technology has changed domestic space by making a woman “the unskilled spectator who watches the machine function in her place” (p. 212). This gives “rise to gray, homogeneous, empty time, the time of effortless and joyless boredom” (p. 212). I can relate to what she is saying. I don’t wish to go back to a time with more hard labor and work, but I do have moments of “gray” and “joyless boredom.” I’ve learned to fill that time with my own research and academic work, and also with reading. I think what she’s really voicing here is a longing for the past. She says, “A number of repetitive and daily tasks have been lightened or simplified—for which one is thankful. But all of that has had its price and broken the ancient balances in the transmission of savoir faire and the management of time” (p. 212). I guess everything has a price, it just depends on whether or not we think it was worth paying. Her comments here seem to be in direct conflict with Ruth Schwartz Cowan’s More Work for Mother (1983), in which she investigated the history of technologies in the home and argues that this technologization of the home has increased work for women. With industrialization, Cowan argued, men and children left the home, leaving women to do all of the work themselves, and even with machines, that leaves a woman there to run the technological systems and she’s therefore tied to the home. I see both similarities and disparities in what these two women are saying about domestic technologies. I guess I can agree with them both, that industrialization changed things. With power, we learn from Giard that “Each of us has the power to seize power over one part of oneself. This is why the gestures, objects, and words that live in the ordinary nature of a simple kitchen also have so much importance” (p. 213). Her argument for studying what happens in a kitchen, and in studying everyday life, is placed in power and agency. Along these lines, we come to understand that cooking is about production. In a society that often places women as consumers, a position that isn’t always honored or lauded, we learn that people “become producers of their own little ‘cultural industry’” (p. 254). Women can use the everyday kitchen to produce, and they do so in their own family units. Reblogged this on Literary Wanderings on WordPress. What interesting points you’ve made and discerned from this volume, Emily. I don’t often think critically about “doing-cooking” or how technologies in the kitchen potentially alter the relationship of those in the kitchen with food/cooking and their homes. What struck me was the argument about technology in the kitchen and how the exchange of more time from technology has a price. It sounds like the longing is not for the past per se, but the feeling of being skilled and being valued for those skills. Do I wish to churn my own butter? No. Do I wish someone would give me thanks as if I had spent hours churning my own butter? Yes. I think in many ways technology actually enables men and women to become producers in the kitchen of their “cultural industry” without sacrificing this feeling of worth (i.e. by making more complex foods more easily), though it is also easy to see the flip side of how technologies can trap women into feeling like they are tied to the home. Very interesting discourse. Thank you! Ngan, thanks for summing it all up so nicely and for recognizing the nuances I was getting at. I think you articulated them well. You helped me to understand exactly what the tension is and how it might relate to us now. Yes on not wanting to churn my own butter, and yes on wanting to be recognized for the domestic work I do. Thanks! That’s an interesting take on the so-called mundane task of cooking, especially the two different perspectives on the increased use of machines in the kitchen. There’s something to be said for the stress relief offered by repetitive tasks like manually grinding herbs or making bread but with the increase in demands on the time of today’s women, there’s nothing like a time saving device in the kitchen when you need it! Whether you use it or not is up to you but having the option is what matters. Agreed! The option is what matters. I’m still not sure what to make of the idea that these devices aren’t really time- or labor-saving, but I’ve certainly benefited from them in ways that my ancestors didn’t. You know, if you feel like doing some sort of comprehensive review of the first book that would be interesting… not that I’m reading it right now and do not understand it at all or anything. Pingback: More Work for Mother | The Bookshelf of Emily J.